He confessed that, “I can’t wait to get up tomorrow. It’s as if every day, someone shakes the dice, and it’s a whole new game”. Of course James was referring to travel, but also to the newest cross-generational craze, birding. In his role as one of the guides at Rondeau Provincial Park, located in Morpeth, in Ontario’s Southwest, James leads hikes, especially around the migration seasons in May and August, when common and rare birds, displaying everything from dull camouflage to magnificent colourful plumage, choose Rondeau, or Long Point or Point Pelee as their oases or ‘gas stations’, to rest and fuel up for the next leg of the migratory journey. They move in on mass one day and could be gone the next. 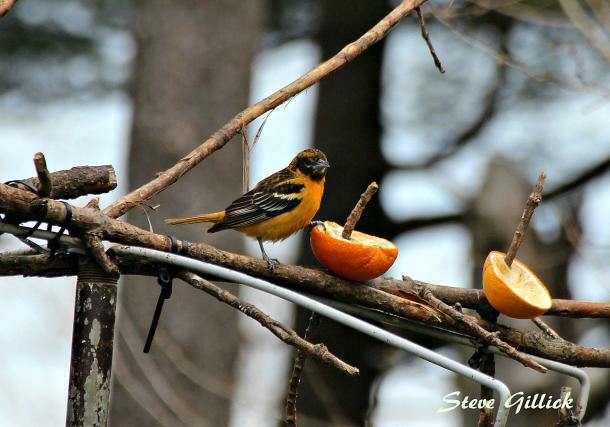 And birders by the hundreds, carting everything from huge zoom lenses to simple point-and-shoot cameras, converge on the area to catch a glimpse of a rare Prothonotary Warbler or a bright red Scarlet Tanager or a flashy orange Baltimore Oriole. 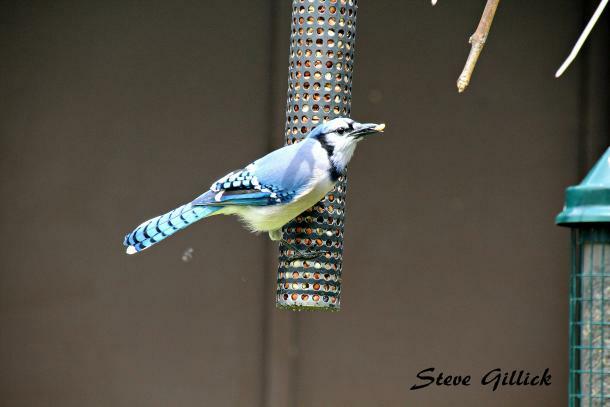 Bruce Dilabio, our guide at Point Pelee National Park noted that for decades, birders were seen as geeks, but now ‘bird watching has become mainstream and digital photography has turned just about everyone into a photographer”. And this means that while some birders photographically shoot the birds, others seem content to shoot themselves (selfies!) with a tiny dash of Avian colour in the background, while surrounded by a Carolinian forest. But it’s more serious than that. As James Turland humorously complained, “people get hooked going around the world to see more and more birds” and sure enough, the birders with whom we spoke, casually name-dropped destinations such as Panama, Costa Rica, Cuba, Antarctica and South Africa as places to visit, watch and photograph birds. James suggested that 1) Birds are the easiest form of wildlife for anyone to see, and 2) Travelers can combine birding with almost everything else they are doing, whether it’s relaxing on the beach, hiking a trail or exploring a new destination. And this is exactly what we did on our way to participate in the annual Birding Festival. Just west of London, we traveled south of Highway 401 to Highway 3, the historic Talbot Trail, and found the Crazy 8 Barn. The 8 sided (octagonal) structure was built around 1898 for stabling animals. It was abandoned for many years before Susanne Spense dismantled it and with the help of her partner, Manfred Wiehle, rebuilt and opened it as a café, complete with home and garden furniture and curiosities for sale. It’s a great place to stop for lunch and have a chat with Susanne about the area attractions that include Clearville Park and the old Guyitt House, a ramshackle, almost ‘haunted-looking’ house just down the road. Before settling in for the evening, we visited Rondeau Provincial Park. 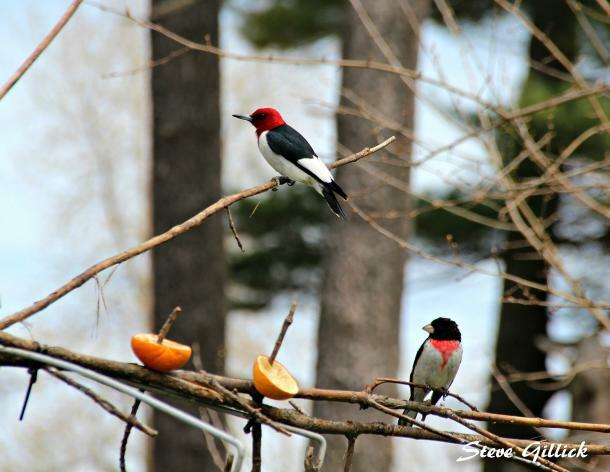 The bird feeder at the Visitor’s Centre is enough to turn any sceptic into a birder, as Red-headed and Red-bellied Woodpeckers, Rose-breasted Grosbeaks, Common Grackles and a few opportunistic squirrels and chipmunks came to dine on sunflower seeds, suet and oranges. And then a walk on Tulip Tree Trail led us to see Cardinals, Nuthatches, Oven Birds, Goldfinches, Downy Woodpeckers, and more; a total of 27 different species in only a few hours. Our accommodation was in Ridgetown, a small community just 18 kilometers north of the Park. We stayed at the Dempster House, a cozy Bed and Breakfast on Main Street, and had dinner at Station 11, where friendly owner Wayne Yeck steered us toward the amazing Hawaiian Nachos (made with wantons), local craft beers and an impressive veggie pizza. But birders keep birding hours, so we were on the road at 5:30 the next morning to join James Turland’s bird hike. While some birders are ‘visual’ and therefore find it difficult to go anywhere without packing their binoculars, the majority of birders are both visual and audio (‘song sleuths’). They listen for the “peter, peter, peter’ call of the Tufted Titmouse, or the “sweet, sweet, sweet I’m so sweet” tune of the Yellow Warbler. And so for the next three hours, in the spirit of a Treasure Hunt, we explored different areas of the Park, for a magical time listening and watching the birds. And this really brought up another attraction of birding, which is the love of physical exercise and the connection with nature, shared by many birders and travelers alike. With discovery on our minds we drove east to Erieau to check out the Bayside Brewing Company where two couples, Nancy Cowan and husband Ken, and Frank Thompson and his wife Josette, decided to start a brewery as a semi-retirement project. With a waterfront pub and a brewing operation that now requires a larger facility, the owners are anything but retired and thoroughly enjoying themselves as restauranteurs relating to customers, brewers sharing ideas with other craft brewers in Southwestern Ontario, and employers giving students a summer job. For the record, the two ales and two lagers they make are really good. We tried them all! It’s a pleasant one hour drive from Erieau to Kingsville where it’s only fitting to take the Lake Erie North Shore Wine Route, home to 20 wineries include Pelee Island Winery. The grapes are grown on the Island which is the southernmost point in Canada and has a climate similar to grape-growing regions in Europe. We enjoyed tastings of Sauvignon Blanc, Gewurztraminer, Pinot Noir and Cabernet Sauvignon/Petite Verdot. Our comfortable accommodation was not too far away, at the Heart and Soul Inn, located in a 1906 Victorian home. In the late afternoon we drove to Point Pelee National Park to enjoy the Twilight Delaurier Trail Hike (and to catch the dance of the Woodcocks), and then the next morning, just after sunrise, we were back at Point Pelee, on a morning hike of the Woodland Trail. 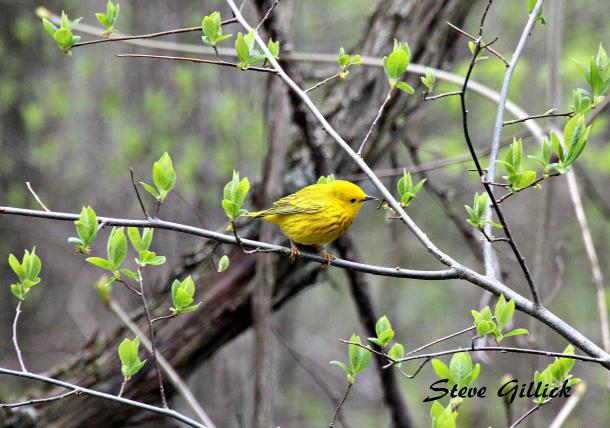 The park is famous for songbirds so we were in Warbler-heaven with Nashville Warblers, Chestnut-sided Warblers, Cape May Warblers, Blackburnian Warblers, Black and White Warblers and the ubiquitous Yellow Warbler. This, aside from Wild Turkeys, Ruby-crowned Kinglets and a very friendly Scarlet Tanager who posed for us at the ‘Tip’ of Point Pelee. And again, the hundreds of people of all ages and all physical abilities who were exploring, admiring, zooming-in, photographing and thrilling at seeing the birds was inspiring. One woman confessed that this was the 47th year that she and her husband were attending the Birding Festival. On the last day of our journey we drove east to the town of Beachville where we met our hosts from Oxford County: Meredith Maywood, a Tourism Specialist and Phil Holst, the Vice-Chair of Stewardship. The purpose of our visit was to experience the Thames River Wetlands and see how the old riverbed was being revitalized into a productive natural area for wildlife and for the community. To that extent, Wood Ducks, Mallards, Canada Geese, Swallows, White-tail Deer, Muskrats, Garter Snakes, Turtles, Song Sparrows, Red-tailed Hawks and Great Blue Herons have re-populated the wetland. It’s a project in the making with a focus on educating the next generation about the importance of wetlands and the migratory corridor. 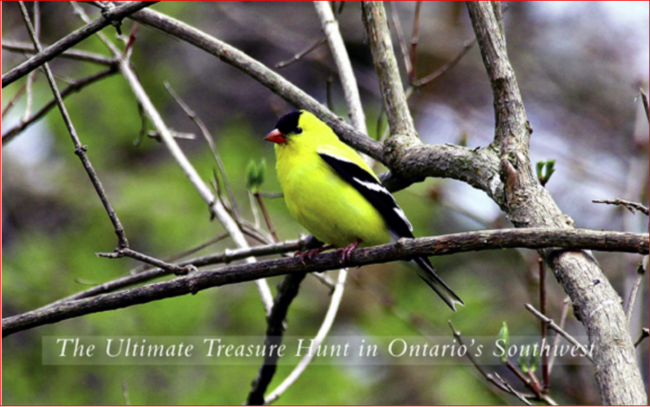 The Ultimate Treasure Hunt in Ontario’s Southwest is an exciting, challenging adventure that involves exploration, walking through forests, spotting birds, experiencing marshes and wetlands, as well as discovering areas of the province that tend to be a bit off the travel radar screen. Like any good Treasure Hunt, the rewards are in the form of the people you meet along the way, feelings of exhilaration and accomplishment, and golden memories. To read more from Canadian World Traveller, click here.